Tonight after the bell Amazon (AMZN) will report their Q4 earnings, the options market is implying about a 5.5% one day move tomorrow, which is rich to the average of about 3.75% over the last four quarters. With the stock at $1722.50 the Feb 1st 1722.50 straddle is offered at about $95, if you bought that, and thus the implied move you would need a rally above $1817.50, or a decline below $1627.50 to make money. Street estimates are reasonable for the December quarter, with greater potential for modest upside than downside. In terms of the March Quarter outlook, we view Street assumptions (~20% Y/Y revenue growth and 5.0% Op. Margin) as reasonable, and thus Street estimates as bracketable. 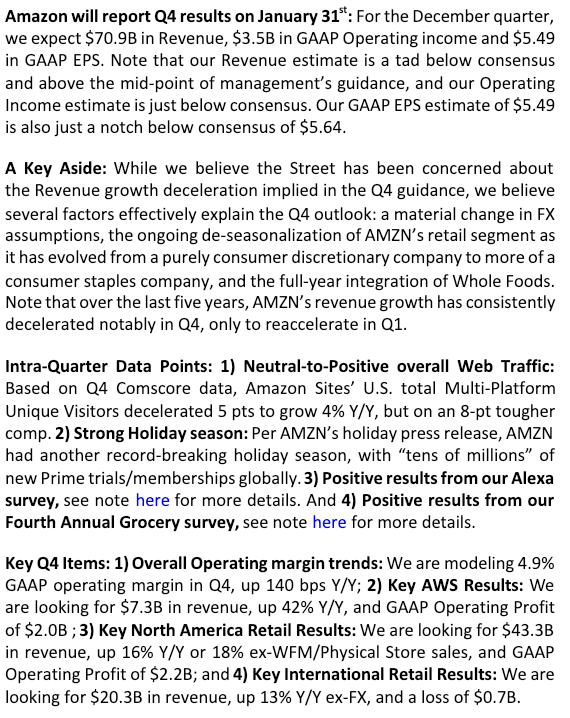 My View: if AMZN misses on their lowered revenue estimates and guides revenues down for Q1, and operating margins are below consensus, then the stock will easily be down $100 or so in line with the implied move. If the company comes in meaningfully above their lowered guidance and is able to guide just inline for Q1 with consensus operating margins then the stock is on its way back above $1800. 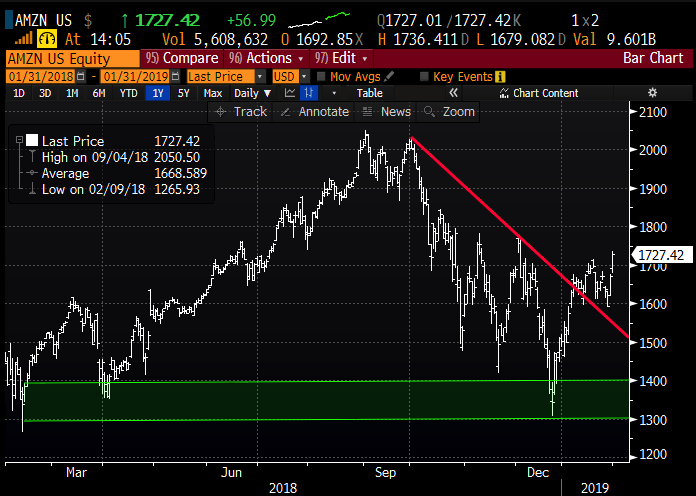 Given the fact the stock has outperformed the broad market off of the lows, and has traded up in sympathy with good results from AAPL, and Facebook this week, I suspect an inline quarter and guidance is met with a somewhat muted reaction. I really hate trading earnings in names like AMZN that trade at 1720 and have strikes every $2.50. Verticals always look bad, for instance, the Feb 1st $1722.50 – $1822.50 call spread is $42, or about 2.4%, less than half the implied move. Risk $42 to possibly make $58 in one day if the stock is up 5.5%. Seems like a bit of a coin flip where the odds are not 50-50. If you are a gambler but might have conviction, in a stock like this, playing for a one-day earnings move you just risk what you are willing to lose and buy at the money puts or calls. Its important to remember that FB’s 12% move today was on a market cap that was nearly half that of AMZN’s on last night’s close. The point being, it will take a very unexpected beat or miss for AMZN to outperform its implied move. I’ll offer our normal disclaimer for long premium directional trades into events like earnings, you need to get a lot of things right to make money, first and foremost direction, the magnitude of the move and of course timing.